Now you can get a .com domain name for just $.99 only. This Godaddy Coupon will work just once in your account. For user other then United states , who want to availing this offer have to change their location and currency to US. You can find more Domain coupons from Godaddy on our domain section. You can See in picture below where domain cost $.99 only which final cost is $1.17 only . This a great offer first domain in your new account. This the best domain deal which you can get other wise the second options is go for Godaddy hosting renewal option where we will pay $12 for one year web hosting and get a free Domain name. Hope this information will help you. This coupons is for new user only, but maximum time every one can use this once. 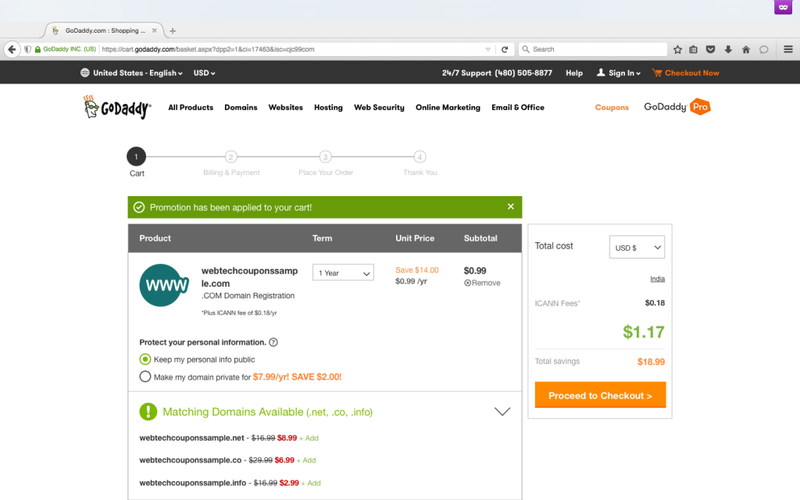 If you already used this $.99 godaddy coupon, then make a new account than this coupon will work for you.